So, up until this point, my husband has managed to escape any real significant embarrassment in my stories. Oh, I have talked about how we met, and his less than adventurous culinary tastes. I may have mentioned a drunken party foul or two, and I DID post that picture of him in yellow tights. But compared to all the stories about my smelly teenagers and their nether bits, Greg has really dodged some bullets. That ends today. We are talking about gas. And I don’t mean ethanol, petrol or helium. Not argon, hydrogen, carbon dioxide, carbon monoxide or ether. There will be no discussion of butane, oxygen or halogen. Nope. We are talking about methane. Toots. Farts. Whistleberries. I say, you’re right! But…Children adore it. Wives fear it. Animal rights activists use it as thinly veiled subterfuge in their battle against the beef industry. Apparently, the evil beef industry is responsible for high levels of methane, from the cows doing what cows do after they eat. Which is funny—because wouldn’t there be MORE methane if we quit eating all the cows? Actually, the human digestive tract produces several types of gasses, of which methane is only one. But the other ones are odorless, and methane is, well, NOT odorless. Some foods produce more gas than others because they contain compounds that the human body does not break down and absorb. If you eat it, and it does not break down and get absorbed by your body, then it has to leave your body or you would blow up and die. When it’s put like that, you would think people would be glad of their gas. Some people, such as myself, would rather have their fingernails ripped out with pliers than ever, ever produce methane. In the 17 years we have been together, my husband has received no indication that my body functions properly in this manner. Maybe there really is a stick….nevermind. On the other hand, my husband dabbles in gas like DaVinci dabbled in oils. He is an artiste! A savant of gas. His plumbing is a finely tuned machine–the minute he is done eating, the car windows start rolling down. It’s enough to bring a tear or two hundred to the eye. The kids beg that beans not be made available to him. With good reason. Beans contain a sugar compound called oligosaccharides. The enzyme that breaks this type of sugar down is not produced in the human body. Thusly, these sugar molecules are not broken down and absorbed by the small intestines the way other sugars are. Instead, they are broken down in the large intestine, into the gas that will eventually send your family scrambling for fresh air. I am guessing it didn’t work. But, the flip side to all this toilet humor is this: the foods that produce the most gas, are also the healthiest. Beans and other legumes, cruciferous vegetables such as broccoli, cauliflower, cabbage, etc., and fruits…Aside from being high in octane, they are also high in fiber. Beans have the added benefit of being high in protein, making them an excellent source of low fat, high fiber, lean protein nutrition. With your good health in mind, I am glad to offer you three great bean recipes. And tell your dining/sleeping companions that I apologize in advance for doing this to them. I am sure they are lovely people. Like roasted chick peas or soy beans, pinto beans may be toasted in oil and spices until crunchy. I serve them like mixed nuts when serving a Texican feast. Rinse and drain beans. Spread out on paper towels to dry, and pat with additional paper towels. Place on a baking sheet, and toss with the olive oil to coat. Mix all of the spices together, and toss with the beans. Spread evenly across baking sheet into one layer. Heat in oven for 5 hours, stirring every hour. Remove from heat, and allow to cool completely. Jeff was my best friend’s brother-in-law when I was in college. He made some killer beans. I don’t know if there was ever actually a written recipe, but this is my rendition of them. 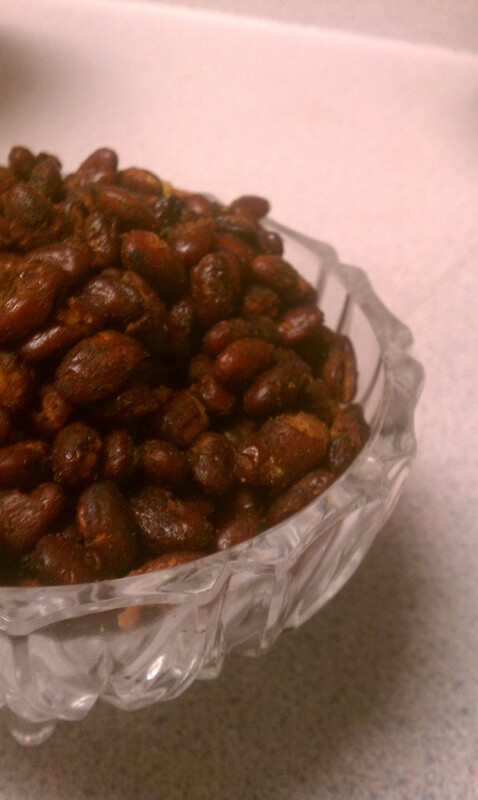 A little bit sweet and a lot of savory, they are good with anything that you would serve with pinto beans or baked beans. Cook bacon in dutch-oven or soup pot over medium heat until bacon is almost crispy. Add chopped peppers, onions and garlic, and cook until softened. Stir in parsley and heat for 2 minutes. 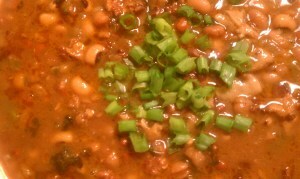 Add all beans (do not drain) and seasoning, and reduce heat to medium low. Cover and cook for 30 minutes. You can also cook the bacon and vegetables ahead of time, and then throw everything in a crock pot for slow cooking. I know it sounds weird, but these are delicious. You don’t actually taste the beans. 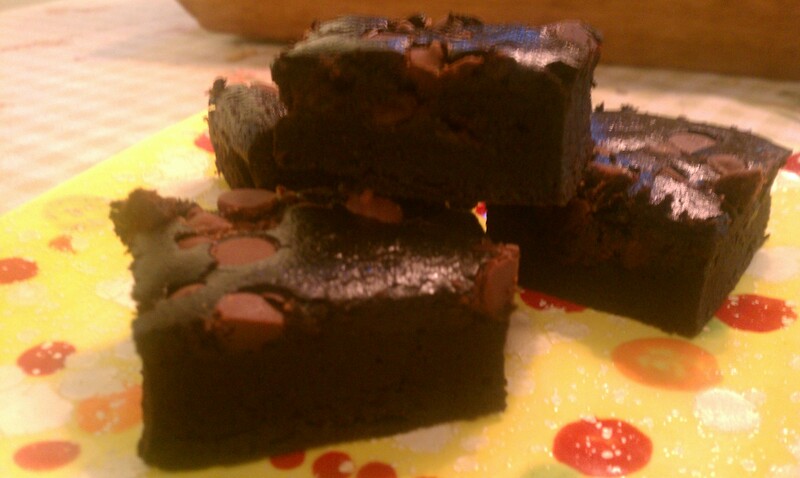 These make for a smooth, dense, super chocolate-y brownie that you don’t have to feel guilty for eating. Whiz all ingredients (except for chocolate chips, dried fruit, or nuts) in a food processor for 3 minutes, scraping down the bowl a few times. Stir in any optional ingredients you are using. Pour into a well greased 8×8 baking pan. Bake at 350* for 30 minutes. Serve warm or room temp. Store leftovers in the refrigerator. Ah yes…you are quite civilized there in Texas…here it’s “Beans beans, good for your heart…” It is actually the way I got my son into beans in the first place…”eat this and see what happens…” (did the same with asparagus…) Wonderful post! What can I say? An amusing post that brings back many memories of childhood and fun with farts with brothers and friends. Yes…you boys DO have fun with farts…. A word of advice…….Never stop for Mexican food (lots of beans) when you are traveling with your husband and 2 teenage girls from TX to NJ…..in December where the further north you go, the colder it gets. Every time I’d start gagging and roll the windows down so I could breath they’d all bust out laughing and break out into a chorus of ‘beans beans the musical fruit’. I just love reading your blogs. I so identify with them and always get a good laugh. Girl, I live in south Texas. All we eat is Mexican food. And my husband promptly gets in the car and starts lettng ’em loose. You always make me laugh and I so enjoy your posts! Such an amazing chef and writer, Greg is one lucky man! Greg is also a wonderful man. A wonderful and gassy man. As our local gas utility says over and over again, “Natural gas has no smell.” They deliberately add smelly stuff to alert you of a gas leak. Otherwise, a natural gas (which is 70% – 90% methane) leak could go unnoticed until the smallest spark created a fireball. In the case of natural gas, the utilities add mercaptans, which are sulfur based compounds known for their stench. In the case of intestinal gas (which is actually more “natural” than what the utilities provide), the methane serves as a propellant for the odiferous components of a fart. Like the gas supplied by the utilities, the methane in farts can also be ignited (to the great amusement of the bystanders). Yes, I have seen such fart-lighting shenanigans…on the dancefloor at a bar in Dallas. By a woman in a wedding dress who was spinning on her back on the floor. Weird. I needed to bleach my eyes after. I’ve heard, but never seen, that cows make a spectacular display. Ah, beans! What’s not to love?!? Just whipped up a batch and froze them for a big camping trip to Wyoming. We’ll be feeding 50! They really do freeze very well in gallon zip bags. Just lay the bags on a cookie sheet in the freezer and they’ll stack beautifully in a cooler. I just take extra chicken stock with me to add for extra soupiness. I wish I’d known the word Whistleberry when my granddaughters thought toot jokes were so funny they’d double over. Now they’re 13 and such things don’t exist. You’re recipes are awesome but your commentary is even better! I’ll be sharing this post…and making bean nuts before the weather turns too warm to open the windows! Great post! I stopped trying to deny my own methane manufacturing abilities years ago. After all, I didn’t want to explode (that’s my story and I’m sticking to it). Correct me if I’m wrong, but those brownies look gluten free. Hmmm. I may be able to use this one for my stepdad. Cool! Also shared on FB with a Gluten intolerant friend. My husband and I have been married for 10 years. What you write about is a daily deal in our house. Not only do I love cooking beans, I love making huge salads made of kale or cauliflower and the likes. So he blames me on his gas – and I have nobody to blame for me other than myself. haha I greatly enjoyed this post! And I will make that brownie recipe!! Thanks for sharing! Most men that I know would be proud to be featured in such a well-written article. And the subject matter? Well, you have to remember that we’re boys and we don’t get embarrassed at that sort of stuff. — And 17 years? No evidence? C’mon Christine! You underestimate my level of uptightedness….I am a ninja. Whistleberries! HAHAHA! I almost lost my diet coke on that one. I’m stealing it. Good stuff.